Classic Flat Athletic Laces for Knee High-Chucks. Lace up your x-high or knee-high chucks in style with these classic standard width flat athletic laces. These 72 inch inch laces are meant for chucks with 10 or more eyelet pairs or if you want additional lace on your nine eyelet pairs. For additional colors see Classic Neon Shoelaces for Knee High Chucks. For additional length see 84 or 96 Inch Skate Laces for Knee High Chucks. To see how white, black, red, navy blue, or royal blue shoelaces look on various pairs of chucks, go to the Classics 1 Shoelaces for Chucks Gallery. To see how brown and cardinal red shoelaces look on various pairs of chucks, go to the Classics 3 Shoelaces for Chucks Gallery. Classic Neon Flat Athletic Laces for Knee-High Chucks. These are 72 inch shoelaces in neon bright colors for Chuck Taylor knee high or extra high tops with 10 or more eyelet pairs. 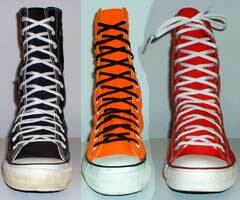 For other colors see Classic Laces for Knee-Hi Chucks. To see how neon lime, neon orange, neon pink, or neon yellow shoelaces look on various pairs of chucks, go to the Neon Classic Shoelaces for Chucks Gallery. Skate Laces for Knee-High Chucks. The 84 inch skate shoelaces are flat and narrow (1/4 inch wide) athletic laces that can lace up through the 12 pairs of eyelets contained on knee high chucks with a lace remainder of 3.5 - 4 inches on each side. They give you plenty of extra lace if you want to lace through the eleventh eyelet pair. The 96 inch skate shoelaces are flat and narrow (1/4 inch wide) athletic laces that can lace up through the 12 pairs of eyelets contained on knee high chucks with a lace remainder of 11 inches on each side. They give you plenty of extra lace if you want to lace through all twelve eyelet pairs. See the Photo Gallery of 84 and 96 Inch Laces on Knee High Chucks for pictures of how these laces look on Knee High chucks.